I'm going to start a weekly update to everyone on the local “interested in Bernie campaign” list. If you don't want to get this, please email me and I'll take you off the list. If you have news that you want the whole community to know, please email me. If you want to help put this together, please email me! PARADE 4 BERNIE! I just learned that the La Crosse Dems will march in the Bangor Parade THIS SUNDAY, August 9. I received word from the coordinator that BERNIE T-SHIRTED, BERNIE SIGN-CARRYING MARCHERS ARE WELCOME!!! You do not have to be an official Dem party member to participate. LaXDems is #33. The parade starts at noon. Be at position 33 by 11:45 a.m. Line up on Labus Drive. For more info, contact Paul at pwk54[at]yahoo.com or 608 783-6206. Directions: Take I-90 Bangor exit, turn left, go past the grocery store to the stop sign. Turn right and then left on Commercial St. Next block is 16th, turn right to the end, Labus Dr. for the line up. 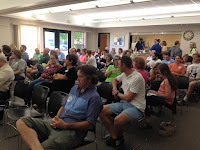 MORE THAN 100 PEOPLE ATTENDED La Crosse's 7/29 BERNIE ORGANIZING EVENT! Nationwide, there were more than 100,000 who turned out to organize for the Bernie Campaign. In La Crosse, we had more than 100 people at two sites. Thanks to Robert for hosting the Old Crow event and Cathy for hosting at the South Side Neighborhood Center. * Be at local events like Irish Fest, Oktoberfest, etc. LAX4BERNIE TEAMS ARE ORGANIZING NOW! Three new groups will work on getting the local Bernie campaign moving right away. The OUTREACH team will coordinate tabling, handing out flyers, reaching out to diverse communities, setting up speakers with local and neighborhood groups, and getting the word out about voter registration. Members of the MEDIA team will work on making Bernie stuff for local events (buttons, stickers, shirts), writing letters to the editor about Bernie, helping to administer current and start new social media sites, taking photos/videos of local Bernie events, monitoring local media to make sure Berne coverage is there and accurate. Right now, each team has its own email list. If you'd like to be involved on one or more teams, please email Cathy. LAX4BERNIE TABLING - SPACES AVAILABLE! We are tabling for Bernie at Cameron Park for a couple of hours a day on Friday evenings and Saturday mornings. 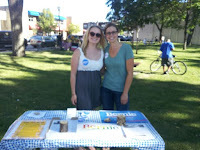 If you would like to sign up to table, please visit http://tinyurl.com/LaXTable4Bernie. We have spaces available! We may add other sites soon. If you have suggestions, email Cathy. Thanks, Lee W., who has volunteered to store and maintain the current tabling kit. CONNECT WITH LAX4BERNIE ON SOCIAL MEDIA! Right now we have a Facebook page, a Twitter feed, a Yahoo Groups listserv, a Tumblr account, and this blog that will be mostly about local LaCrosse4Bernie efforts. This is the best way to keep informed about what's happening locally. What are we missing!? Who will start it?! Let us know!! Bernie will be on CBS's FACE THE NATION this Sunday, August 9. THE NEXT BIG [BERNIE] THING The national Bernie team is hoping to make the first official Democratic debate (October 13) the next big nation-wide Bernie event. More details will be available soon, but in the meantime, let's find a space that will hold 100 to 150 people, that has good video (the debate will be televised on CNN but there may be a simultaneous Bernie fact-check feed), that let's us bring treats, and that will be a rip-roaring spot for us Bernie-acs to come together and share our energy! VOTER REGISTRATION TRAINING OFFERED IN CITY OF LA CROSSE. As we know, it's super important to make sure as many eligible voters as possible are registered to vote. Bernie will need as many votes as possible. People who wish to be certified to register voters in the City of La Crosse ay sign up for one of two training sessions offered by Teri Lehrke, the City Clerk. Please note that voter registration must be a NON-PARTISAN activity. Registrars must register anyone who qualifies and may not do any politicking while registering voters. The sessions are: Monday, August 31 at 1:30 p.m. and Wednesday, September 2 at 9:00 a.m. Both sessions will be held in the third floor conference room in City Hall, 400 La Crosse Street. Call Ms. Lehrke to register for a session: 608 789-7556. THIS IS JUST FOR CITY OF LA CROSSE! If you live in another community, contact your city clerk to request a training session. BERNIE TEAM SEEKS VOLUNTEERS FOR KNOWLEDGE RESOURCES With few resources and not many paid staff, the Bernie campaign is setting records! But they need more resources for event organizers. Right now they are seeking good organizers and writers to help set up a Bernie resource center that will include an event hosting handbook, talking points memos, issues information flyers and more. If you have experience, skills and several hours per week to work on a small team with other people from around the country by phone and/or email, please email zack[at]berniesanders.com with subject line KNOWLEDGE. HELP LAX4BERNIE GROW! Do you know people in our area who want to help elect Bernie Sanders? Please have them email couleeprogressive[at]hotmail.com to be put on the mailing list and get information about local activities and opportunities to help. WHAT ELSE DO YOU WANT TO KNOW? We'll cover it in next week's LaX4Bernie News. Remember, if you DON'T want to get this weekly update, please let me know and I'll take you off the list! JULY 29 is having KITTENS!